Fiber optic lighting between fabric layers on front and sides. Uses 2 CR2032 Batteries which are included, and are replaceable. 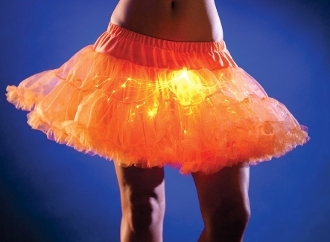 We also have this fabulous Light-Up Tutu in White, Neon Lime Green and Black and Red!